EO4wildlife aims at building a platform who delivers operational services to the end users. The current project will enable the partners to integrate already existing building blocks into a homogeneous, powerful and operational platform, and in the mean-time open up the possibilities to research new approaches and offerings. Do you want to test the platform as new user? Select “New account” in the platform link or send us an e-mail (service-desk-eo4wildlife@lists.atosresearch.eu), we will contact you soon. Every three years the international sea turtle community in the Mediterranean hold a conference to discuss findings, inspire each other and promote the conservation and research of sea turtles across the region. The EO4wildlife project was presented during the poster session. The EO4wildlife Project, funded by the European Union's Horizon 2020 research and innovation programme, started three years ago with the primary objective of allowing management authorities, biologists and ecologists to easily access and process earth observation data. New video about the project Platform! Version 3 of the EO4wildlife platform has been released to all partners on November 2017. It provide a wide new set of features, including the access to new datasets with smart data downloading and management mechanisms, the integration of new processing services, various improvement on platform usability (ergonomic issues, securing, user feedback...) and on interoperability issues (in particular to support tracking data from various sources such as Seabirds or Seaturtle platforms or to provide an open endpoint for any external application to automatically push data to the platform) and a completely new visualization panel for tracking and metocean data. A new version of EO4wildlife will be ready for beginning of 2018 with the main goal of providing a more extensive and scientifically accurate description of the processing service it offers and improving the ergonomics and usability of the platform by addressing all the feedbacks gathered from our community of users. As a new functionality this version will also allow users to chain processing services and thus define reusable and configurable workflow of services. The Application Layer design of the platform will be driven by different scenarios in the field of wildlife movements, habitats and behaviour. These scenarios represent the technical solutions to implement in order to address various problematic of the end users of the project: the Use Cases. Seabird tracking data and oceanographic variables can be combined to develop predictive habitat utilisation and species distribution models. Authorities could use these as dynamic management tools (e.g. fisheries, shipping, Marine Protected Areas) to help them make real-time decisions to protect seabirds. The first objective of this scenario enables fish scientists to track pelagic species with light based geo localization devices and to get a state of the art estimation of the fish trajectory. A second objective is to enable analysing and understanding bluefin tuna behaviour or appearance correlated to environmental data of salinity, primary production and sea surface temperature during spawning season in the Mediterranean Sea. This scenario will focus on setting up tools for Marine Protected Areas managers to help them monitor important marine mammal areas and better predict the distribution and habitat preferences of tracked or surveyed species. This scenario takes place in some MPAs in the French Exclusive Economic zone. The final objective of this scenario is to support scientists involved in marine turtle studies to predict turtles’ distributions (through defining habitat preferences and environmental niches) using environmental data, to inform dynamic management scenarios. 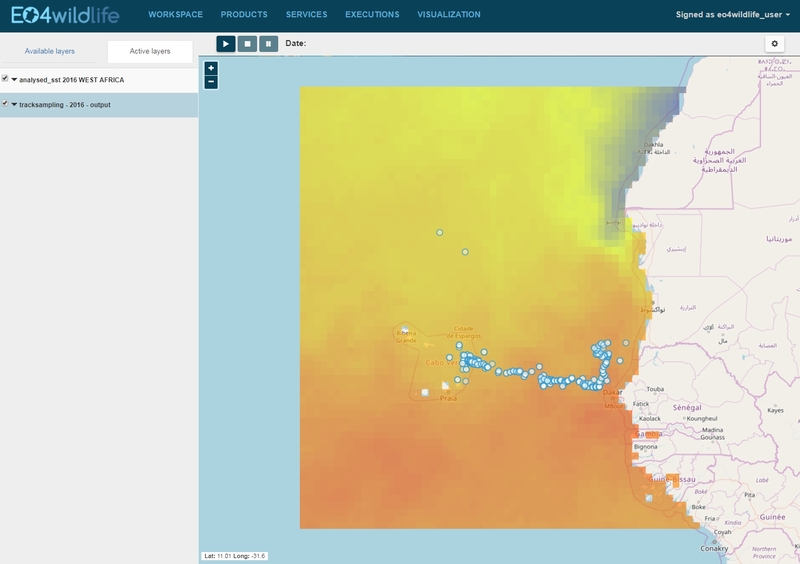 (level 2 and level 3 products, to be determined during the requirements phase), ARGOS databases of archive and real time, thematic databank portals such as seaturtle.org, wildlifetracking.org or seabirdtracking.org, and other Earth Observation and MetOcean databases; locally or remotely, and simultaneously. Design and develop an operational and easy-to-use platform to query, search, mine and extract information from these different databases. End users will be able to fusion and cross correlate heterogeneous data via advanced data analytics methods in order to discover information, patterns, validate or invalidate hypothesis, detect potential similar or reproducible behaviour or favourable conditions associated to the movement of animals, oceanographic mobiles, or potentially any kind of geo localized mobiles. 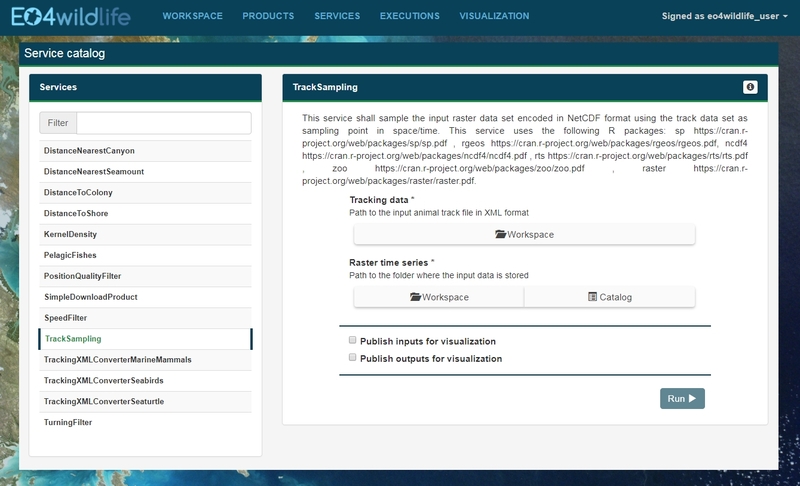 connections to other external databases (owner database), facilities to develop and run algorithms for dedicated data analytics, models and data visualization functionalities. EO4wildlife team is a well-balanced consortium, covering the required multidisciplinary expertise to successfully carry out the required research tasks as well as to assure a manageable project structure. The project consists of partners from France, Spain and UK, supported by well-known international associations through an external Advisory Board.